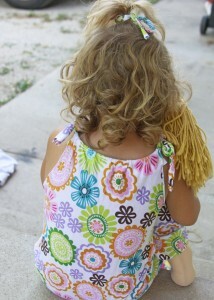 A great garage sale find, and a clearanced yard of fun jersey fabric inspired this super easy sewing project. When my little lady scored a Cabbage patch Doll for $ 0.75 at a garage sale that needed some clothes, I decided to make not only one for her new dolly, but one for her that matched! She loves that she can match her new baby, and they couldn’t be a cuter pair. 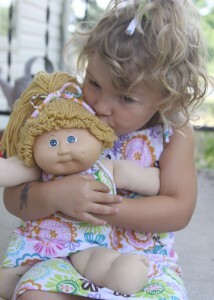 We were doing a little garage saleing this summer when my little girl spotted two vintage Cabbage Patch Dolls. There were two of them at this particular sale. One had clothes and a diaper and there was another that was just the doll without any clothes. We purchased both dolls for less than $2.00 and I was super excited for her to have some sweet dolls that were just like the ones that I had s a little girl, and for $2.00 I was sold. I promised her that I would make a new dress for the one that was missing an outfit. After a couple of months of her carrying her naked doll around I finally got around to making a little dress for her. I happened to be cleaning out my fabric drawer, where I found a yard of jersey fabric that I had grabbed on clearance at Hobby Lobby last winter. I love working with jersey because it comes in so many great patterns, is inexpensive, soft and comfortable to wear, and washes well. The best part about working with jersey is that it doesn’t need to be hemmed around all the raw edges, which makes sewing projects using it quick and simple, my favorite. After doing t-shirt to tank top transformations this summer for myself and my daughter I learned a great technique that is similar to creating a pillowcase dress for a little girl. I used the technique in the tutorial as my inspiration for creating a little dress for my daughter’s doll. Because I had enough fabric on hand, I thought it would be really fun to make a dress not only for the doll, but for my daughter as well! That way she could match her new baby. I also created matching hair ties and a tiny pair of undies for the doll. To create the dress for my daughter I used one of her summer dresses that fits her well as a pattern. I can’t say exactly how much fabric you will need, but 1 to 2 yards will do depending on the girl’s age that you are making it for. I basically laid a dress of my daughters out and traced around it onto my jersey fabric folded in half. I had two pieces of jersey cut into the same shape. I laid the two cut pieces (printed side together) and sewed a seam up the dress on each side (stopping before the arm hole. I then folded the tops down about an inch in the front and back of the dress and sewed two more hems. These served as tubes to put ties in for the straps of the dress. I then used two long and narrow pieces of jersey and put them through the tubes that I sewed. Instant straps for the dress by tying the ends together. Check out my tutorial on the t-shirt to tank top transformation if you would like some more detailed instructions! 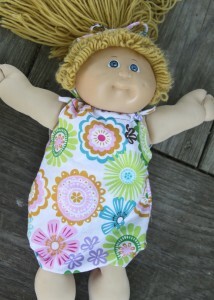 Making the dress for the doll was just as simple, but I had to make up the pattern and size. I basically made two small rectangular pieces of fabric and added arm hole cutouts to the shape. I added straps in the same fashion as my daughter’s dress, and her dolly had a simple little summer dress to match hers. I had a few little scrap pieces that I used to tie bows in both of their hair, which thrilled my little girl to pieces. 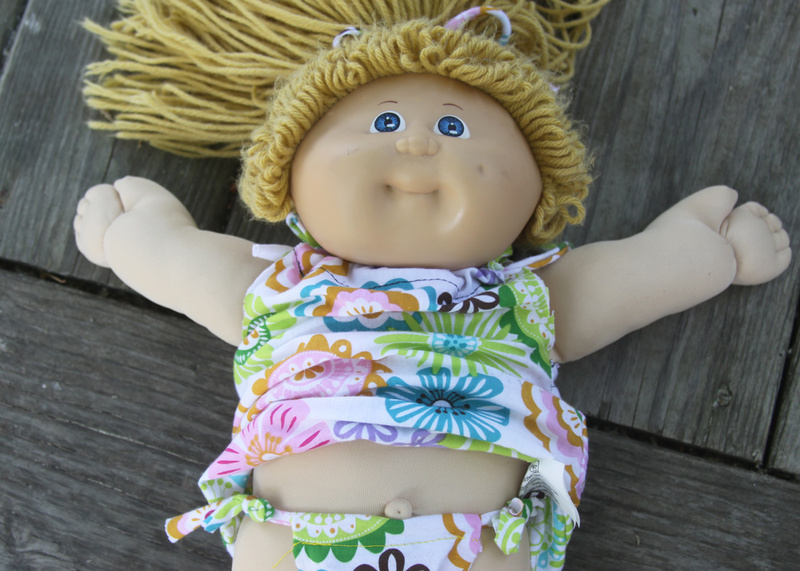 Because cabbage patch dolls have little butts that are usually covered by clothes and I was making a dress, I figured I better make her a little pair of “unders” as my daughter calls them, so that she could be decent when she goes out into public to play with my daughter. I cut two triangle shapes and sewed them together to create the underwear. I then used the sewing a tube and adding a strip of fabric to tie them together technique. This way my daughter can easily untie them herself and change her babies diaper. Both of their dresses turned out super cute, and it is so fun for her to take her baby places in their matching dresses. 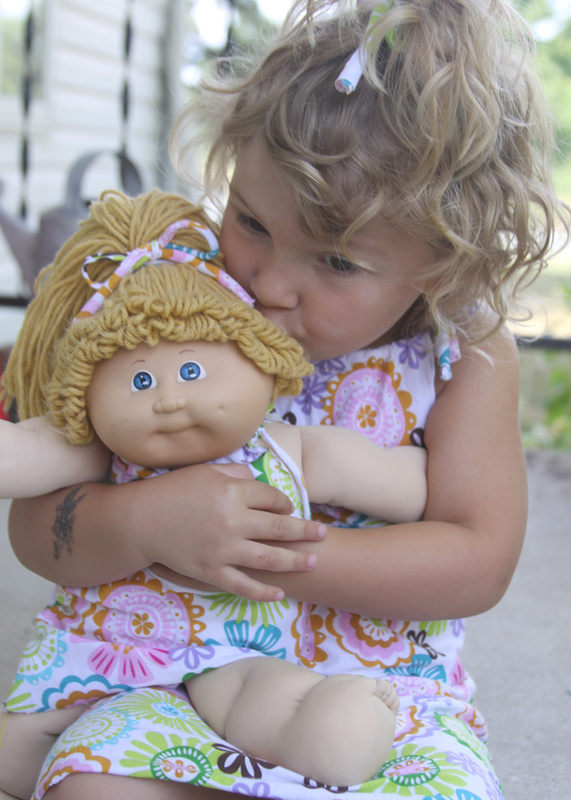 I kind of feel like I have a third child now, because her Cabbage Patch goes everywhere with us, and has to be belted in a seat in the car, fed with us, and brush her teeth each night. At least she doesn’t eat much, and I love that my daughter is enjoying her $ 0.75 baby doll so much thanks to the simple little sundresses! Adorable! 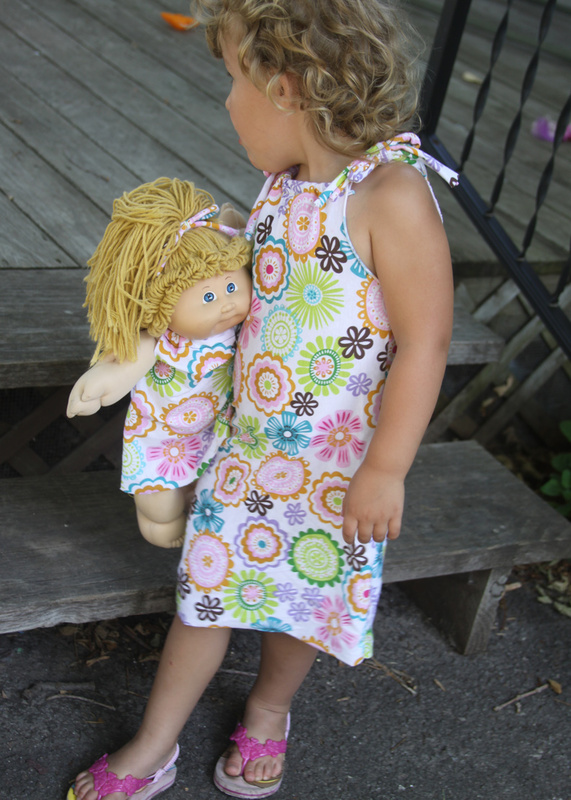 Love the fabric, matching outfits, and taking the doll everywhere! Cabbage patch dolls were so expensive when we were kids – what a find! I was so excited to find them for her! I think I was lucky to have the one I had when I was little! 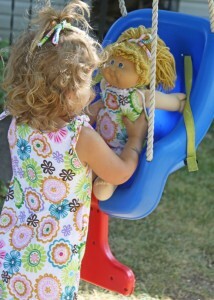 She is just so sweet with her doll!